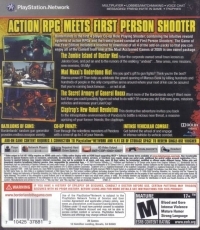 Borderlands is the first 4 player Co-op Role Playing Shooter; combining the intuitive reward systems of action RPGs and the frantic-paced combat of First Person Shooters. The Game of the Year Edition includes all 4 of the add-on packs so that you can enjoy all of the content from one of the Most Acclaimed Games of 2009 in one sweet package. The Zombie Island of Doctor Ned - Enter the corporate owned small town known as Jakobs Cove, and put an end to the rumors of the walking "undead"...New areas, new missions, new enemies, Oh My! Mad Moxxi's Underdome Riot - Are you god's gift to gun fights? Think you're the best? Wanna prove it? Then help us celebrate the grand opening of Marcus Bank by killing hundreds and hundreds of people in the only competitive arena around where your next of kin can be assured that you're coming back famous...or not at all. The Secret Armory of General Knoxx - Want more of the Borderlands story? Want more loot than you could possibly figure out what to do with? Of course you do! Add new guns, missions, vehicles, and increase your Level Cap! Claptrap's New Robot Revolution - This destructive adventure invites you back to the inhospitable environments of Pandora to battle a vicious new threat, a massive uprising of your former friends; the claptraps. BAZILLIONS OF GUNS: Borderlands' random gun generator provides endless weapon variety. CO-OP FRENZY: Tear through the relentless monsters of Pandora with a crew of up to 3 of your friends. 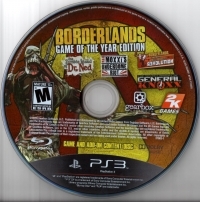 04-14-2016 mrfoxhound Box Text ACTION RPG MEETS FIRST PERSON SHOOTER Borderlands is the first 4 player Co-op Role Playing Shooter; combining the intuitive reward systems of action RPGs and the frantic-paced combat of First Person Shooters. The Game of the Year Edition includes all 4 of the add-on packs so that you can enjoy all of the content from one of the Most Acclaimed Games of 2009 in one sweet package. The Zombie Island of Doctor Ned - Enter the corporate owned small town known as Jakobs Cove, and put an end to the rumors of the walking "undead"...New areas, new missions, new enemies, Oh My! Mad Moxxi's Underdome Riot - Are you god's gift to gun fights? Think you're the best? Wanna prove it? Then help us celebrate the grand opening of Marcus Bank by killing hundreds and hundreds of people in the only competitive arena around where your next of kin can be assured that you're coming back famous...or not at all. The Secret Armory of General Knoxx - Want more of the Borderlands story? Want more loot than you could possibly figure out what to do with? Of course you do! Add new guns, missions, vehicles, and increase your Level Cap! Claptrap's New Robot Revolution - This destructive adventure invites you back to the inhospitable environments of Pandora to battle a vicious new threat, a massive uprising of your former friends; the claptraps. BAZILLIONS OF GUNS: Borderlands' random gun generator provides endless weapon variety. CO-OP FRENZY: Tear through the relentless monsters of Pandora with a crew of up to 3 of your friends. INTENSE VEHICULAR COMBAT: Get behind the wheel of and engage in intense vehicle-to-vehicle combat. 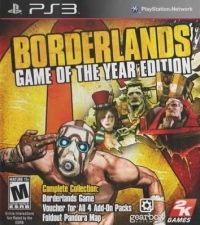 This is a list of VGCollect users who have Borderlands - Game of the Year Edition (Voucher) in their Collection. This is a list of VGCollect users who have Borderlands - Game of the Year Edition (Voucher) in their Sell List. This is a list of VGCollect users who have Borderlands - Game of the Year Edition (Voucher) in their Wish List.